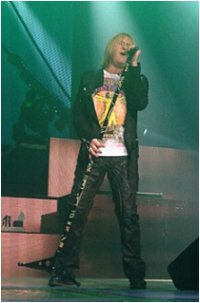 Def Leppard played the 7th show of the 2013 VIVA Hysteria! residency last night at The Joint in Las Vegas, NV with 22 songs played. Night seven saw the band play another 8 song opening set as "Ded Flatbird". No new songs were played but once again the order was changed with only 'Foolin'' kept in from the previous show. The set had a mix of songs from five different albums including four from 'High 'n' Dry'. 'Promises' was played for the fourth time at the residency having been unplayed since 2006 in the US prior to these shows. The 'No Ded Flatbird' sign was used again but like night 6 the band did use the thrust stage before the 'Hysteria' set.